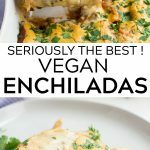 Seriously the BEST Vegan Enchiladas! Made with all whole food ingredients, including easy plant “meat”, black beans, and vegan cheese sauce. Enchiladas are the perfect food if you ask me. 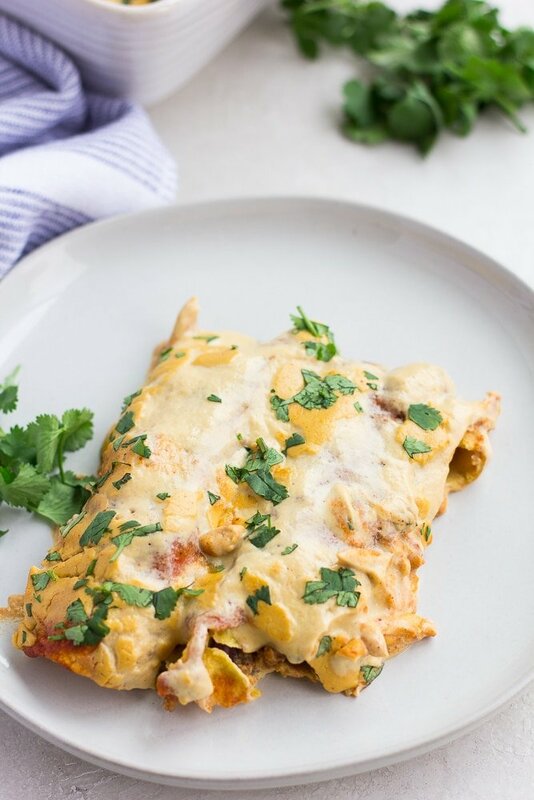 I know tacos are all the rage these days (for good reason), but don’t forget about enchiladas! Corn tortillas are stuffed, rolled and drenched in red sauce and cheese. 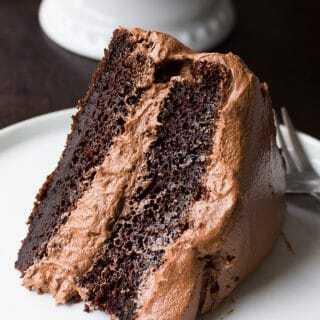 Total yum. 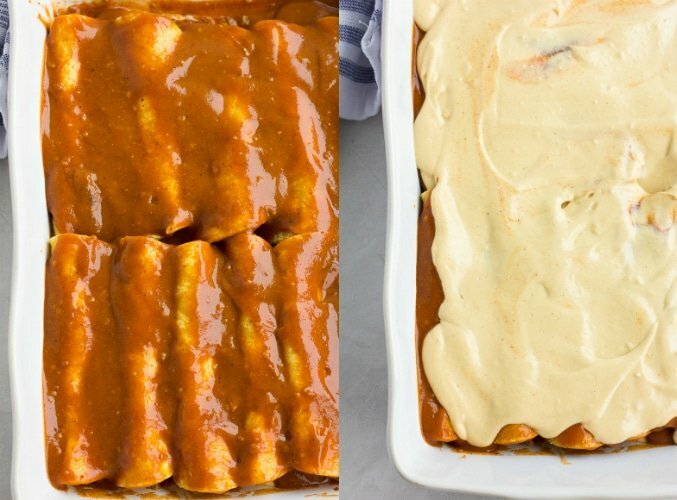 These really are the best vegan enchiladas, ever. 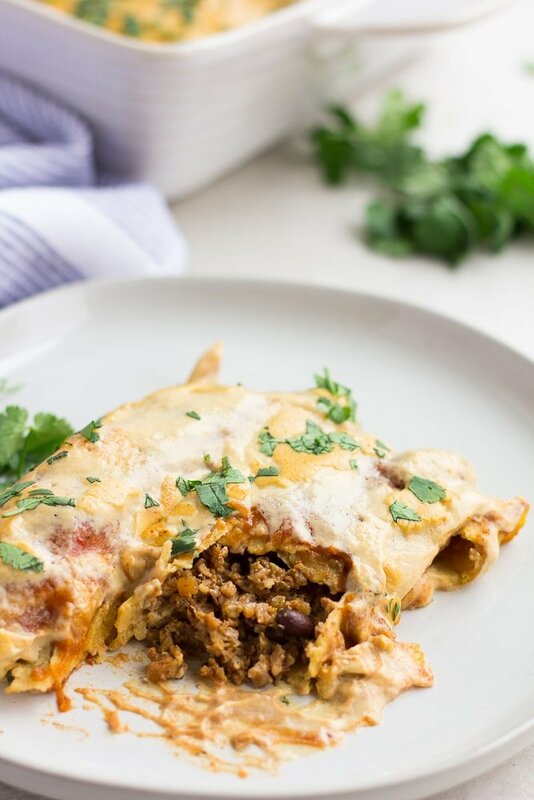 They will remind you of beef enchiladas, except they are meat free, dairy free and even good for you! 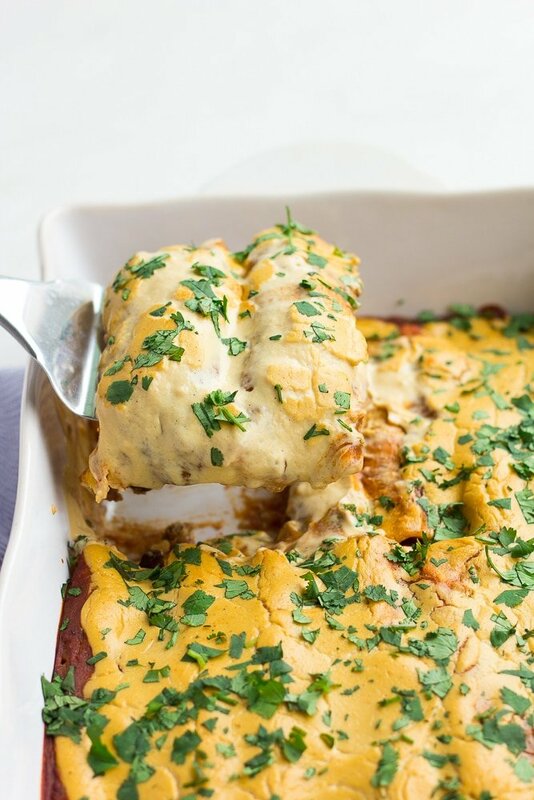 There are 3 important parts to making these delicious whole food plant based enchiladas: easy enchilada sauce, taco “meat”, and vegan cheese sauce. There is no oil involved here, or store bought vegan meat or cheese. 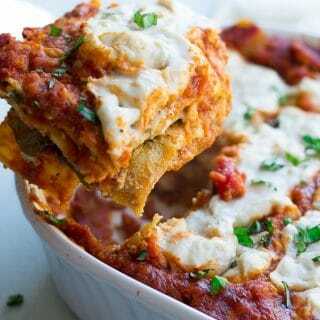 I’ve also kept the recipe as simple as possible so you can have dinner on the table ASAP! 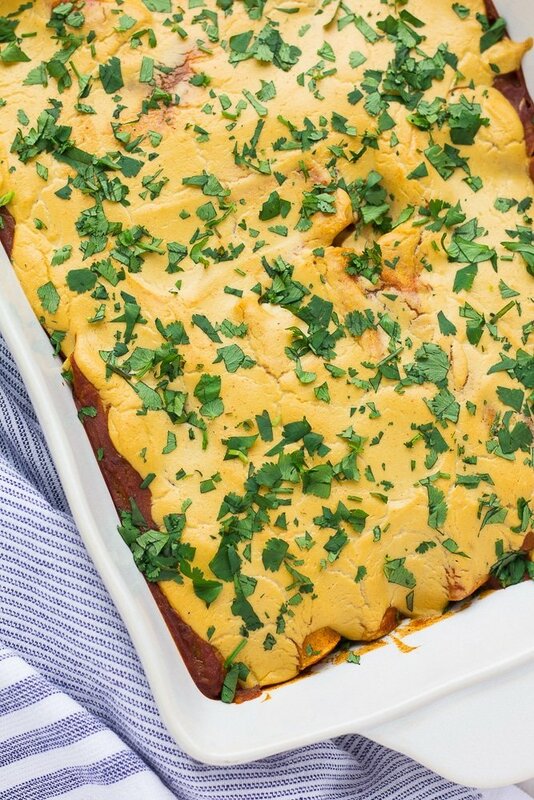 It’s easy to make vegan enchiladas gluten free, or nut free if you need to. I’ll show you how, so read on! Can I buy pre-made enchilada sauce? 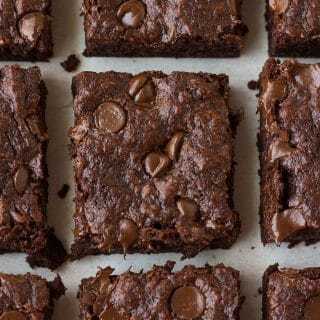 You can, but the flavor is much better if you can take 5 minutes and make your own! If you buy enchilada sauce at the store, make sure to check the ingredient list, as there is often milk added. Here is one brand that is definitely vegan: Simply Organic Enchilada Sauce. 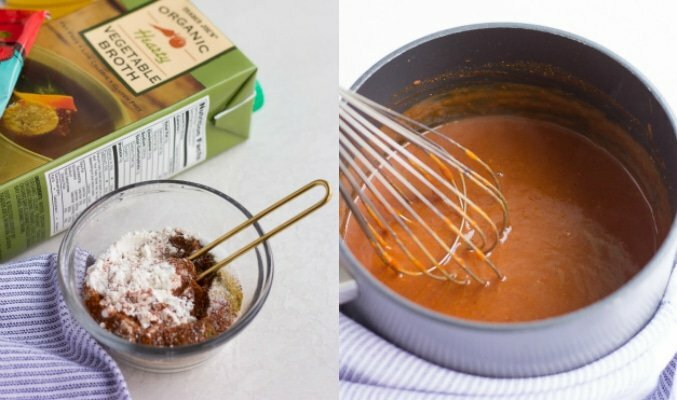 How do you make vegan enchilada sauce? Making enchilada sauce is really fast and easy. Gather all the ingredients, because it will go quickly. Measure all the dry ingredients (flour + spices) and place them in a small bowl. Heat a few tablespoons of water in a medium pot, then pour the flour/spices mixture on top and whisk constantly for a minute. Now whisk in the tomato paste, then slowly pour in the vegetable broth, whisking constantly. Bring to a boil, then simmer for about 5 minutes, whisking frequently to remove any lumps. Remove from heat, stir in the apple cider vinegar and add salt to taste. SEE RECIPE CARD BELOW FOR FULL AMOUNTS AND INSTRUCTIONS. Using a food processor, pulse your cauliflower to make cauliflower rice. Then pulse the mushrooms and walnuts a few times until they are a similar consistency as the cauliflower. You could chop them all very small with a knife if you don’t have a food processor. Add the vegetables and walnuts to a large pan, heat to medium-high heat. Pour in the vegetable broth, spices and soy sauce. Stir well to combine everything. Continue to cook for 10-15 minutes, stirring frequently. Add salt to taste, then stir in the black beans. I went with my Easy Vegan Nacho Cheese Sauce, which is made super creamy from raw cashews, and is so easy to make. You only need 1/2 of a recipe, so just cut everything in half. I highly recommend it, BUT you could also use my Nut Free Vegan Cheese Sauce. 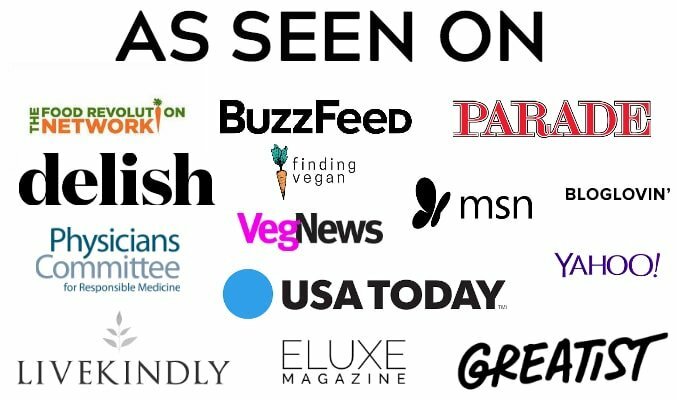 The other option is to use dairy free vegan cheese shreds, such as Daiya or another brand. You would probably need 2 bags for this recipe, and I would only recommend this if you already know of a brand you like, as some people really dislike the vegan cheeses you can buy at the store. If you can, use one of my homemade cheese sauces, they are easy to make and so much better tasting! 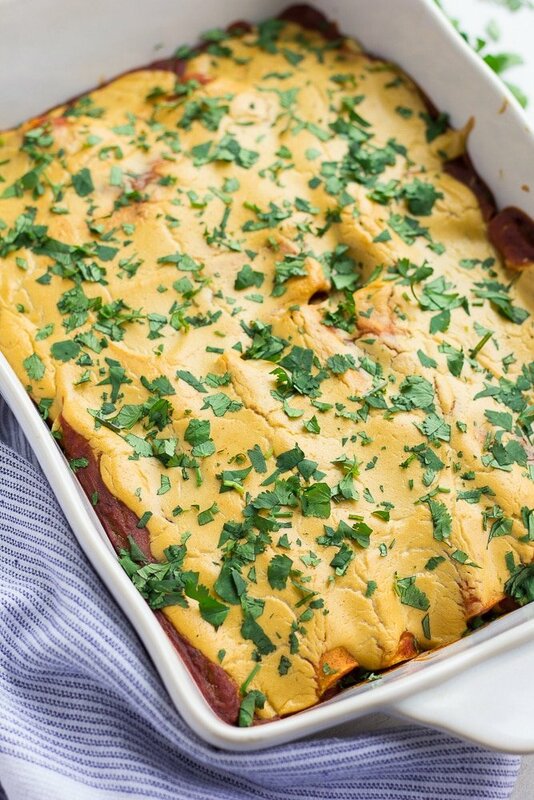 Can I use flour tortillas for vegan enchiladas? Yes, you can, though traditional enchiladas are made with corn tortillas. Sometimes I like to switch things up and use flour though. You will probably need 6-8 large flour tortillas if you want to try this. Easy! For the enchilada sauce, use brown rice flour or a gluten free mix in place of the all purpose flour. Then, make sure to use gluten free tamari instead of soy sauce. And of course, use corn tortillas, not a corn/wheat mixture or flour tortillas. Omit the walnuts from the “meat”, and use more mushrooms or cauliflower. Use my Nut Free Vegan Cheese Sauce. Want more vegan mexican recipes? Seriously the BEST Vegan Enchiladas! Made with all whole food ingredients, including easy plant "meat", black beans, and vegan cheese sauce. Make a 1/2 recipe of Nacho Cheese Sauce. Set aside. Measure and add all the dry ingredients to a small bowl (flour, chili powder, garlic powder, cumin and salt). Have the tomato paste and vegetable broth ready and nearby. In a medium pot over medium heat, warm the water. Once warm, pour in the flour/spice mixture and whisk constantly for about a minute. Whisk in the tomato paste, then slowly pour in the broth, whisking constantly. Bring to a boil, then simmer for 5 minutes, whisking often to remove lumps. It should thicken a bit. Remove from heat, and whisk in the vinegar. Taste and add more salt as needed. Set aside. If using whole cauliflower, wash, chop off the florets and place them in a food processor. Pulse, creating rice. Add 2 cups of cauliflower rice to a large pan on the stove. Add the mushrooms and walnuts to the food processor, and pulse until they are a similar consistency as the cauliflower. Don't over process. Add to the pan with the cauliflower. Turn the heat to medium-high, and pour in the vegetable broth (2 tablespoons), spices and soy sauce. Stir to combine. Continue to cook for 10-15 minutes, stirring frequently. Add salt to taste, and remove from heat. Stir in the black beans. Preheat oven to 375 degrees F. Spread 1/2 cup of enchilada sauce in the bottom of a 9x13 inch casserole dish. Wrap 5 tortillas at a time in a damp paper towel, and microwave for 30 seconds to 1 minute to soften. This will make them much easier to roll. Fill each tortilla with a scoop of "meat" and a spoonful of cheese sauce. Roll and place into the prepared pan. Repeat until all the tortillas are used. Pour the rest of the enchilada sauce on top, then pour the rest of the cheese on top of the red sauce. Bake, uncovered, for 20-25 minutes, until bubbly. Top with chopped cilantro and serve hot. For gluten free, use gluten free flour in the enchilada sauce, tamari instead of soy sauce and 100% corn tortillas. To make this recipe easier, you could buy pre-made vegan enchilada sauce. Check ingredient list as some brands have milk in them. 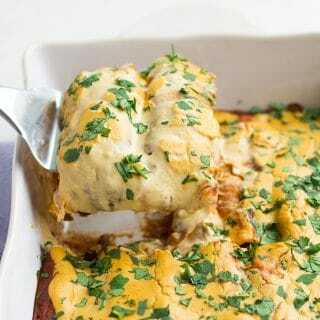 You could also use vegan ground "beef" instead of the plant meat, or top the enchiladas with shredded vegan cheddar in place of the nacho cheese sauce. But they taste the best as written. Try subbing flour tortillas for the corn if desired. To make nut-free, omit the walnuts from the "meat" and use my Nut Free Cheese Sauce instead of the cashew based sauce.